The Río Plátano Biosphere Reserve encompasses both mountainous and lowland tropical rainforest, full of diverse wildlife and plant life. Endangered animals like the Giant Anteater, Ocelot and Jaguar can be found here. The Reserve is located on the Río Plátano in the La Mosquitia region on the Caribbean coast of Honduras. Miskito and Paya Indians still live in the forests. They are responsible for stone inscriptions and petroglyphs. The Río Platáno Biosphere Reserve, Honduras – home to the highest level of tropical biodiversity in Central America, homeland of the Pech and Miskito Indians, and keeper of hundreds of unexplored archeological sites – is in danger. Non-indians are invading the Reserve from all sides, poaching endangered wildlife and fish, slashing and burning ancient forests to sow pastures, and forcing indigenous inhabitants off their ancestral lands. Paradise in Peril follows an expedition organized to document the destruction of this UNESCO World Heritage Site and collect testimony from the native peoples who rely on the Río Platáno for survival. Fewer than 400 individuals have ever completed this strenuous expedition from the rivers headwaters to the Miskito coast of Honduras. I have just returned from my second complete descent of the Rio Platano from the headwaters to the coast. This time i brought along a great cinematographer to capture on film what is really going on in this remote and beautiful place. We are going to produce some footage that shows the uncontrolled invasion of the reserve by settlers and cattle ranchers. Poaching of animals and clear cutting the forest is having a dramatic effect on the local population that is being threatened off their traditional lands. The Rio Platano Biosphere Reserve has become my favorite natural (and one of my favorite cultural) areas in all of Central America, surpassing that of more known countries, in particular Costa Rica. The deep parts of the reserve are amazing untouched, and even where there are larger groups of indigenous people, there hasn't been too much deforestation. The wildlife was amazing (I saw 2 tapir, howler monkeys, spider monkeys, sloths, tree anteaters, white-faced monkeys, an ocelot, jaguarundi, crocodiles and caimans, several snakes and lizards, insects, and encountered several fresh jaguar tracks). The indigenous culture (Miskito, Pech, and Garifuna) is also amazing. It's expensive to explore the reserve, but it's a priceless experience. 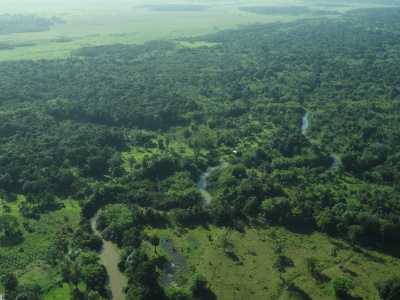 Oxbow lakes: "This reserve protects nearly the entire watershed of the 100km long Platano River, as well as major portions of the Paulaya, Guampu and Sicre Rivers. The rugged mountainous headwaters region, encompassing 75% of the reserve, is flanked by the Platano River and rises to Punta Piedra (1,326m). The river basin drains an area of some 130,000ha and meanders considerably in the lowland region, marooning several ox-bow lakes. " Holocene: The Mesoamerican tropical rainforest evolved after the last glaciation in the Late Pleistocene. Extensions on Tentative List: Rio Platano Biosphere Reserve (2019) - "At the national level, however, the nominated area has since been substantially enlarged"